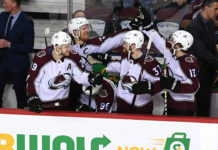 Mile High Sports continues their Colorado Avalanche season-in-review series with forward Alexander Kerfoot. The 23-year-old surprised everyone from the start of training camp and went on to have a productive rookie season. We will take a look at the numbers behind Kerfoot’s game, how he looked to the eye, give him a final grade for this past year, and provide an outlook on what to expect from him next season. To say that Kerfoot exceeded expectations would be putting it lightly. 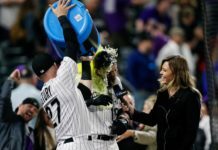 He signed with Colorado just a few weeks before training camp, and from the start of camp, it was clear that he wouldn’t go away. He picked up a primary assist on opening night, and that was just a sign of things to come for the rest of the year. 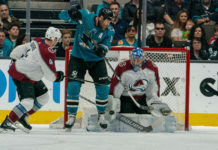 Kerfoot finished the season with 19 goals and 43 points, cementing him as the Avs’ leading scorer up front — that wasn’t on the high-scoring top line, at least. Let’s take a deeper look into his numbers. Kerfoot managed to play in 79 games, as well as all six playoff games. That’s kind of astonishing for someone listed at 5-foot-10 and 175 pounds — and who almost certainly falls short of both of those numbers in reality. Kerfoot took a beating in every game, and always managed to come back. In four years at Harvard, Kerfoot played a total of 121 games, so with 85 in total this year, he played over 2/3 the number of games he played in his entire collegiate career. Given all of that, he was surprisingly consistent, outside of a 12-game stretch in February and March where he didn’t register a single point. That stretch hurt his numbers in both February and March, but in every other month, he consistently produced. Let’s get one thing out of the way here. Kerfoot doesn’t like to shoot the puck, and the numbers back that up. In 79 games, he only managed to put 81 pucks on net. That is staggeringly low, given how much ice time he was given in offensive situations. At five-on-five, he was only generating a mere 7.33 shot attempts per 60 minutes, which was far and away the lowest among Avalanche forwards. Despite all of this, he managed to score 19 goals riding an absurd 23.5 percent shooting percentage. Is this repeatable? I would guess not, but we’ve seen a pass-happy forward put up consistently high shooting percentages in the past in Alex Tanguay, so it isn’t impossible. In terms of possession numbers, Kerfoot was in the bottom third among Avalanche forwards at only 46.98 percent. Seeing as how this is a shot-based metric, and Kerfoot refuses to shoot the puck unless he absolutely has to, this may never be something he excels at, unless he improves significantly defensively. The low possession numbers are a little disappointing given that he got pretty favorable minutes, starting over half of his shifts in the offensive zone. While Kerfoot did well creating high-danger offensive chances, he didn’t do all that well stopping them. Sitting at 43.08 percent, Kerfoot had the second lowest high-danger scoring chance for percentage among the Avs forwards, with only Matt Nieto posting a lower number (Nieto sees considerably more difficult minutes). Even with those poor numbers, he was on the ice for five more even-strength goals for than against. Moving forward, Kerfoot will have to make strides defensively in order to avoid being seen as more of a specialty player that you have to shelter heavily. Given he only averaged 13:27 of ice time a game this year, that’s kind of the role he played his rookie season. You just have to watch Kerfoot a few times to see that he’s probably going to frustrate fans for the entirety of his Colorado career with his unwillingness to shoot. Some players just see the game differently and want to create for their teammates, and Kerfoot is one of them. You’d like to see him put a few more pucks towards the net, but this is the style of player he is, and that’s probably not going to change. Perhaps the greatest attribute to Kerfoot’s game is his on-ice intelligence. He knows where to be at all times, and is usually a step ahead of the play offensively. Even in the defensive zone, you can see that he can make good reads, but there’s still room for improvement there, and given his size, he’s at a disadvantage down low against bigger forwards. While the percentages would say that Kerfoot repeating the success of his first year may not be likely, his hockey IQ gives you a reason for optimism. A lot of things have to go your way to shoot 23.5 percent in a full NHL season, but you also have to put yourself in the right position to get those 19 goals. Beyond his IQ, Kerfoot is a tremendous distributor of the puck. He consistently gets the puck to his teammates at the right time, giving them an opportunity for success. If anything, his point totals overall may not change much because he’ll probably see his assist totals rise while his goal totals drop. Kerfoot’s actual shot is his weakest attribute offensively, and may also be part of the reason why he just doesn’t shoot the puck all that much. Kerfoot’s toughness, however, deserves a great deal of credit. The man took a physical beating all year long and just kept coming back from it. It’s hard to imagine how he went the whole year without a major injury, but he did it, and at the end of the year, even showed a willingness to play more physical himself. There’s a lot to like about Kerfoot’s game, but his toughness is definitely something that will put him in the good graces of the fanbase. How could it be anything other than an “A”? Kerfoot had zero expectations coming into this season and ended it as the Avs’ top-producing, secondary scoring forward. There is no other way to describe his season other than a resounding success. Now it’s up to him (much like the rest of the team) to show that it was no fluke. This team is in desperate need of secondary scoring, and Kerfoot will get every opportunity to repeat this past year’s success in 2018-19. It’s entirely possible the Avs go searching for a top-six winger in free agency or the trade market, and it’s very possible that if they do get someone, they end up on Kerfoot’s wing. If that does not happen, a good linemate for Kerfoot heading into next season would be Sven Andrighetto. Kerfoot is obviously more of a playmaker, and Andrighetto is a shooter. It would make sense that they match up, and the goal might be to find a winger on the other side that maybe plays more of a defensive/power game to help hide some of their deficiencies. Beyond the hope that he’s able to repeat the offensive numbers he put up last year, you would like to see Kerfoot earn more trust from the coaching staff in terms of playing time. The Avs relied heavily on their vet line, and it’s very possible Blake Comeau will not be back. Others will have to pick up the slack of the 16 minutes a night he played. You would like to see Kerfoot’s ice time jump a minute or two per game, and if it does, that means his overall game will have made strides. 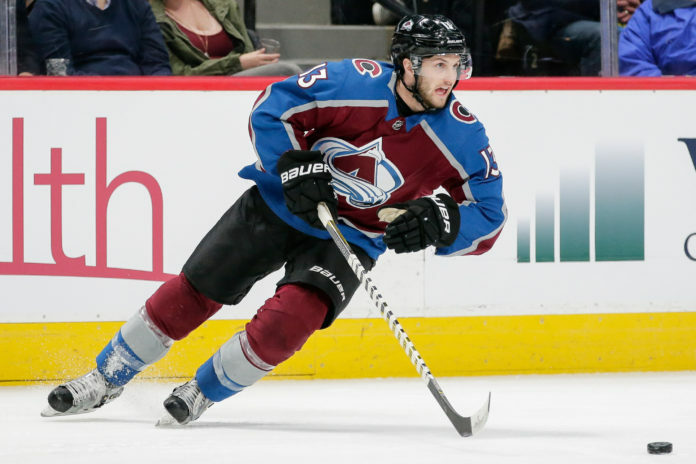 Kerfoot has gone from a complete wildcard to a potentially integral part of the Avs’ rebuild in just eight months. His ability to maintain his production next season will play a big role in the Avs proving this season wasn’t a fluke, and that they’re a team on the rise.